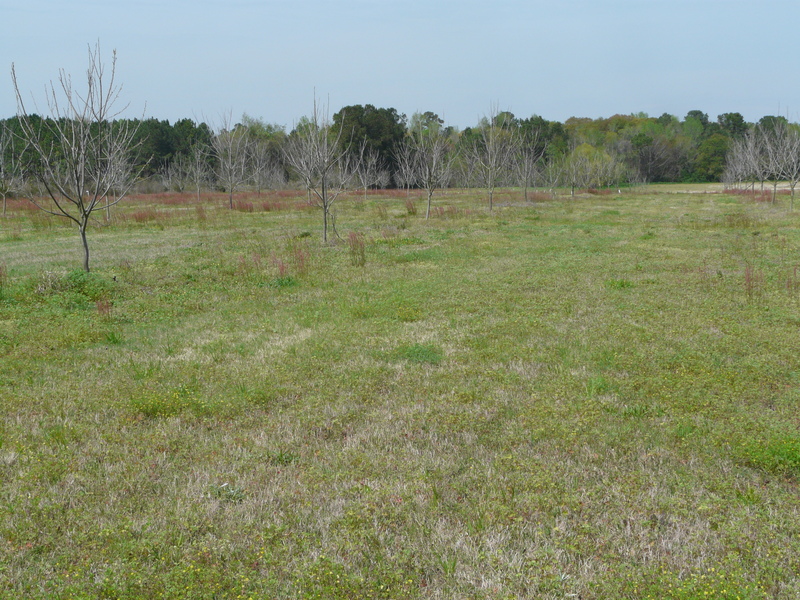 Pecans in the county are being fertilized now, and many trees are at buds break. These are some 3 year old Sumners and Elliots in an orchard that were hit with Asian ambrosia beetles. They are not the most common insect pest, but they can cause problems. The beetles excavate galleries into the tree pushing out strings of boring dust (below). UGA Extension Entomologist, Dr. Will Hudson, said you will see holes that resemble bird shot and sometimes see sap that may crust over. 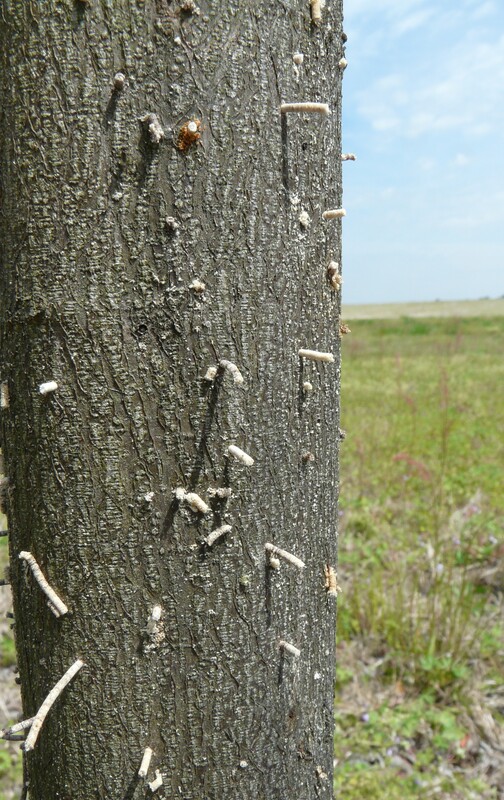 The ambrosia beetles are also pests on ornamental trees. Dr. Hudson says this beetle and the black twig borer are in the same genus and many times found on trees near wooded or natural areas. It is hard to predict what trees will be hit because these beetles attack many trees from different families and are around all the time. There is not much hope for control concerning the trees that are hit, but if some are less heavily infested, then treatment may work. If the trees fail to leaf out, then cut and destroy them. Brooks County Ag Agent, Garvie Nichols, and I talk about the number of pond questions we receive. The most common pond question I receive pertains to weeds. Generally, pond weeds are treated in the spring and fall. Here is a weed I looked at this morning which turned out to be parrotfeather. 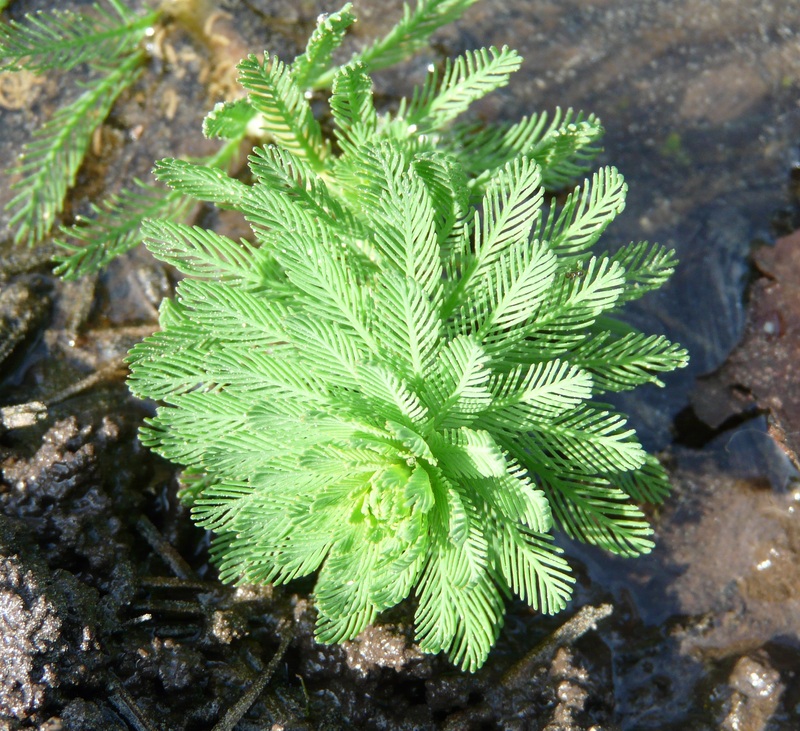 This plant is also used as an aquarium plant. 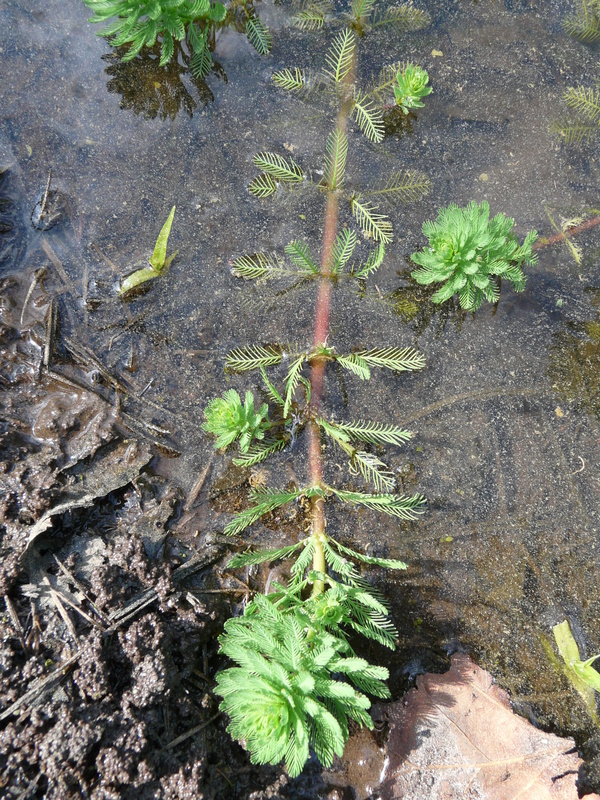 It is a rooted, submerged perennial plant that usually grows in shallow water. At its base the internodes are longer, and they shorten towards the tip. It is better to start with a herbicide to manage pond weeds, and sometimes follow up by stocking grass carp. UGA Extension Aquaculture Specialist, Dr. Gary Burtle says that 2,4-D, triclopyr, or imazamox are good chemical for control of parrotfeather. “Navigate and Weedar 64 is a granular butoxyethyl ester of 2,4-D and has been effective on parrotfeather. 2,4-D compounds are systemic herbicides. Systemic herbicides are absorbed and move within the plant to the site of action. Systemic herbicides tend to act more slowly than contact herbicides. If there are fish in the pond, it is also recommended to treat small portions of the weeds (1/3 at a time) to reduce the risk of oxygen depletion. 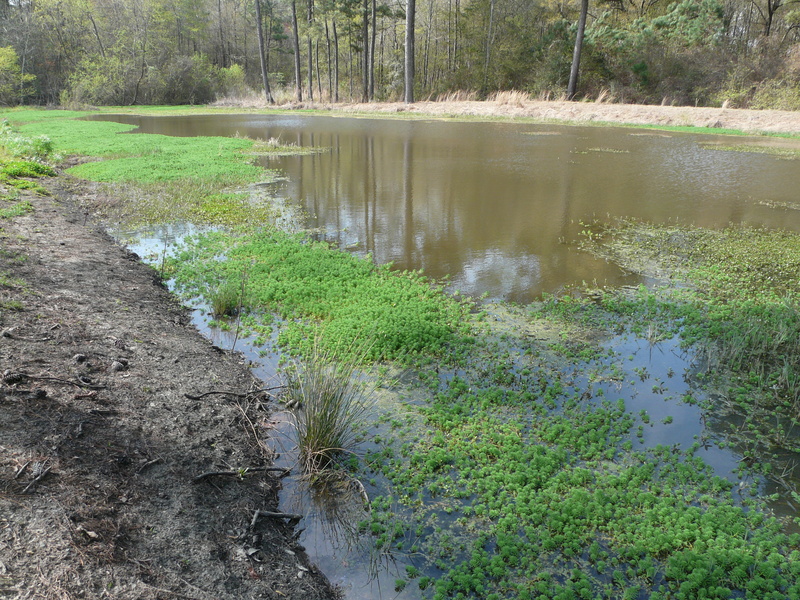 Here is a link to the Aquatic Environments section of the UGA Pest Management Handbook which shows weed control options for pond weeds. If you have ever touched a stinging nettle, you would know it. One got me for the first time last year. I was looking for a wasp after I was stung it hurt so bad. I’ve been getting reports of some stinging weeds in pastures this past week. We looked at a pasture last week where this weed (above) was in pastures and horses got into it. Not all plants of this species sting, but in this picture you can almost see some of the stinging hairs called trichomes. This nettle was growing close to the ground. They are commonly seen along fence rows growing taller. UGA Extension Forage Weed Scientist, Dr. Patrick McCullough, said this photo this is a young stinging nettle plant or closely related species. Weed control options include anything with picloram (Grazon P + D) or aminopyralid (Milestone, Surmount).